A sidecar is a phone accessory device that attaches to a business desk phone for advanced call handling capabilities. Sidecars simplify monitoring of large number of contacts and management of a high volume of concurrent calls. 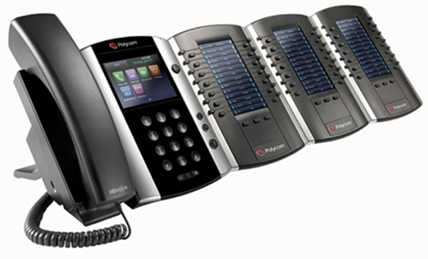 Using the Polycom VVX Expansion Modules known as sidecars, a desk phone can handle additional Busy Lamp Field (BLF) keys and Speed Dial keys. With sidecars, you can accept, screen, dispatch, and monitor calls and reduce the number of lost customer calls, shorten transaction times, and increase the accuracy of call routing. 8x8 Supports 28-key color display sidecar with a color display of assigned keys. We also support a 40-key paper label sidecar that requires a paper label of assigned keys. The supported sidecars are compatible with Polycom VVX 300/310, VVX 400/410, VVX 500, and VVX 600. See the complete list of 8x8 phones supporting Line Keys. 28-key sidecar: 8x8 supports a maximum of three physical sidecars with LCD display. The sidecars can be cascaded together. Each physical sidecar includes three logical pages of 28 line keys (3 x 28) allowing a maximum configuration of up to nine logical pages or 252 additional line keys. Any vacant button can be used for speed dial on the attached sidecars. 40-key sidecar: 8x8 supports a maximum of three physical sidecars with paper display. The sidecars can be cascaded together. Each physical sidecar includes one page of 40 line keys allowing a maximum configuration of 120 additional line keys. Any vacant button can be used for speed dial on the attached sidecars. Note: Sidecars are only supported for BLF and Speed Dial keys. It is recommended not to add more than 50 BLFs per User. BLF keys require more hardware performance than Speed dials. After about 50 keys, depending on the call volume, the phone with sidecars may show performance issues. •	TLS/SRTP is enabled by default. This can be disabled to further help alleviate any potential performance issues with the physical phone. Increase the number of keys on the physical phone. Handle additional BLFs and Speed Dial keys. Monitor large number of contacts and manage a high volume of concurrent calls. Use to accept, screen, dispatch, and monitor calls. Reduce the number of lost customer calls and shortens the transaction times. Increase the accuracy of call routing. Support 28-key color display sidecar with a color display of assigned keys. Support 40-key paper label sidecar with a paper label of assigned keys. You can add a device that supports Sidecars, activate the device, and set up Sidecars via the Users page. Edit or create a user. See how to Add VO Users. Under Voice Basic Settings, select a Device model that support Line Keys, and activate the device. The option to configure line keys appears next to the device. Note: The link only appears for devices that support Line Keys, such as VVX 300. Please refer to the list of 8x8 supported phones. In the Phone keys plan window, click +Add a sidecar. Start adding BLF and Speed dial keys in the sidecar. You can add up to 28 BLF or Speed Dial keys on each page. However, for better performance, we recommend you not to add more than 50 BLFs per user. To delete an existing sidecar, click x next to the sidecar. 8x8 Supports 28-key color display sidecar with a color display of assigned keys. We also support a 40-key paper label sidecar that requires a paper label of assigned keys. For information on how to print a paper label, refer to the FAQ questions: How do I generate line key information for 40-key sidecars? You can add, edit or delete Sidecars from the Users or Devices pages. For a quick and easy access to the Line Key configuration page, go to Home > Devices. Find an activated device that supports Line Keys and is assigned to one. Click View device report.